President Donald Trump's speech on Afghanistan was not received well by Breitbart, the far-right website which has been supportive of his presidency. On its homepage Monday night, Breitbart's top headline said Trump had reversed his previous position with the announcement that more troops would be deployed to Afghanistan. Trump campaigned on a non-interventionist foreign policy. The website called his new position a "flip-flop" and linked to a story which said the speech was "a disappointment to many who had supported his calls during the campaign to end expensive foreign intervention and nation-building." On Twitter, Breitbart staffers drew comparisons between the strategy Trump outlined and President Barack Obama's. Obama 2009: "The days of providing a blank check are over." Trump 2017: "Our support is not a blank check." But Breitbart didn't necessarily place blame on Trump. Instead, it suggested the strategy was the work of National Security Adviser H.R. McMaster, who the website has been extremely critical of. A separate story published on Monday said the speech may have been "alien" to Trump's base, but "it was not difficult to figure out whose influence led to the speech's neoconservative bent." "HR McMaster's voice was clear to hear," author Raheem Kassam wrote. "It's a voice that appears to have been carried over from the George W. Bush administration, and even the Obama White House." 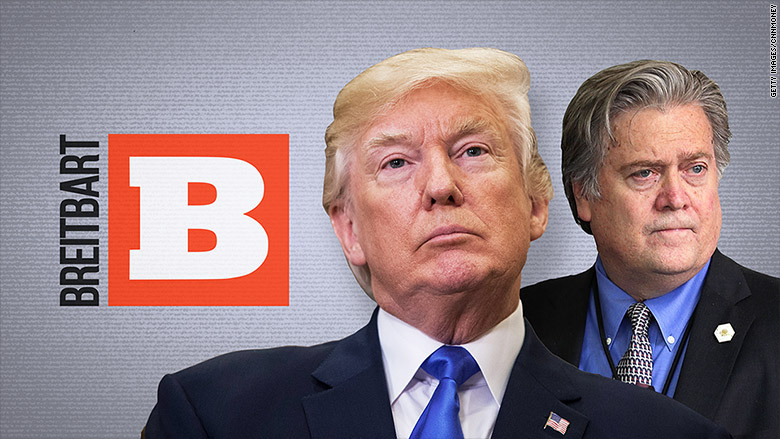 While Breitbart has been critical of McMaster in the past, such criticism is only expected to ramp up now that fired White House chief strategist Steve Bannon has returned as executive chairman of the website. Bannon said in an interview with Bloomberg that he was ready to go to "war" for the president, suggesting he would refrain from attacking Trump directly, but instead zero in on individuals who are viewed as Democrats or "globalists." Bannon clashed with many of these individuals during his time in the White House. "It will be Bannon the barbarian," a person who spoke with Bannon told CNN on Friday. "He's not going to go out peacefully."